October 29, 2018 – Illinois farmers couldn’t control the late-season moisture across much of the state. Prairie Farmer asks Golden Harvest Agronomist Stephanie Porter for moisture management advice in similar situations. Source: Austin Keating – Field Editor – Prairie Farmer in St. Charles, IL. 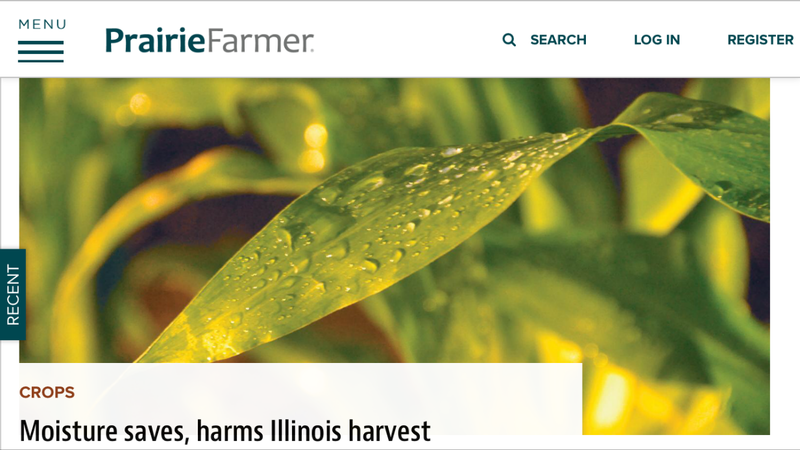 https://www.prairiefarmer.com/crops/moisture-saves-harms-illinois-harvest Prairie Farmeris geared to supply the ongoing management needs of Illinois farmers. Offers information and advice to livestock and grain farmers, including legislation updates and analysis, business and management news, machinery and equipment innovation and use, new products and pollution and environmental issues. Also profiles farming personalities and communities. Learn more at http://www.prairiefarmer.com/.